Agile. Agile is here to save your world. Do Agile and your product would never fail. Right? Wrong! Why? 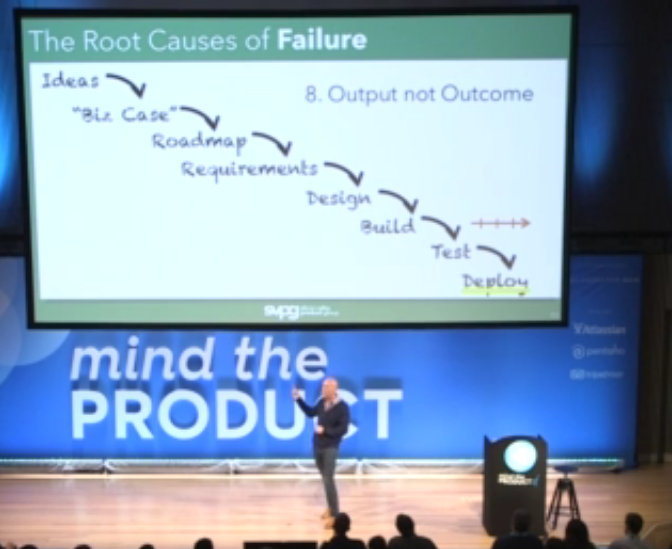 Agile can help with your delivery, but most product failures decided much earlier than delivery. Think how your company makes product decisions. Now draw it. Now think again. Where is your delivery in the entire process? Where your devs, UX, and designers come in? Towards the bottom, right? By the time product concept goes into delivery it could already be a failure. Some time ago I was writing about common problems resulted in product or company failure. It was mainly applicable for startups but surprisingly even big and stable companies experience very similar issues. For every "Google Maps" there is a "Google Wave". For every "Apple Keynote" there is an "iTunes Ping". Why even in a big, resource-limitless companies those failures happen? Hear Marty Cagan, product management veteran, speaker and author talks on this topic. What is this process? Waterfall , classical. Stakeholders and customers are two least valuable sources of ideas. Most valuable source = engineers. They work with technology every day and they are in the best position to know what is possible today. Another source: data. But usually, data is not in the hands of people who provide ideas. Customers are not good in providing ideas for a product. They don't know what is possible, they don't know what they want until they see it. Remark here; customers might not be a great source of ideas, but they definitely the key source of problems. For which we need to figure out solutions. How much money are you gonna make? You have no clue. You can guess, but you never know! We don't know how much it gonna cost either. You can estimate, but still, you never know for sure! Because the process takes so long: startups run out of time, big companies run out of execs patience. Roadmaps are details, not a vision. Items on a roadmap = commitment. Half will not deliver any value. Is not a job of PMs. Product managers often asked to be project managers. This process requires a project manager, not a product. As a designer, you receive something where lot's of bad decisions are already made. This process is a mercenaries process. A designer that receives wireframes = unhappy visual-only designer. If you only use devs to code - you lose at least 50% of their value. Dev is coming way too late in this process. And only here ... only that late ... Agile comes in. Only in a delivery. Which is probably only 10% of the Agile value. It's a project based process. Where what we measure is output, not an outcome. This process is about output. About effort. Not about the outcome. Not about the result. Biggest issue: opportunity cost. The process is long, expensive and you can't have those resources back. 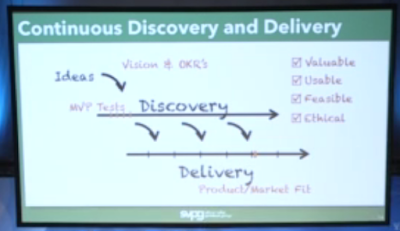 Ideas (more sources) > discovery (lean, customer development) - PM work > Delivery. Best teams try out much more ideas than most teams. 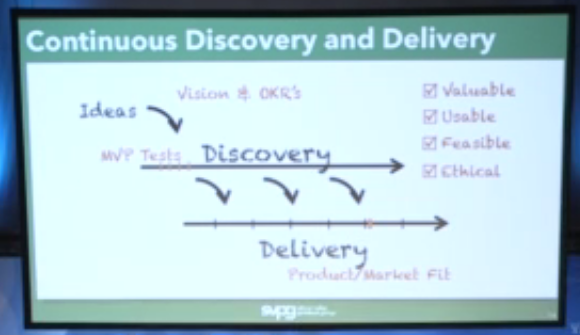 Vision and OKR (objectives and key results). No roadmaps - problems to solve instead. 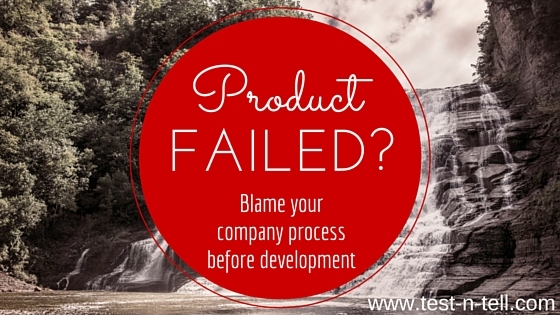 So how do we prevent product failures? How shall we build our processes to minimize chances of doing wasteful work? Listen to Rich Mironov, who was doing product management before electricity was invented, great speaker and author. Rich talks only concrete, that come from the years of experience. Engineers cannot fix that with better coding. Tech debt. As a PM I know I need to invest in it. I don't know how much and what benefits I am gonna have in the future. Portfolio budget is like a household budget. Ask a sales rep why we closed the deal? Coz I am a great sales rep. Why we didn't? Coz features or price. Sales care about closing deals, not corporate goals. Hard to prioritize unlike items. A feature, quality, tech debt, customization for key customers. Pick the most important... Instead, group similar items. Assign the budget to groups. Try BCG matrix for product portfolios. How many products\projects we can fund? Major opportunity gets the new business unit?